There are 3 bones which allow the elbow to bend to the mouth, straighten and allow the hand and wrist to turn up (to carry a plate) or turn down (to use a keyboard). These are the humerus, the radius and the ulna. 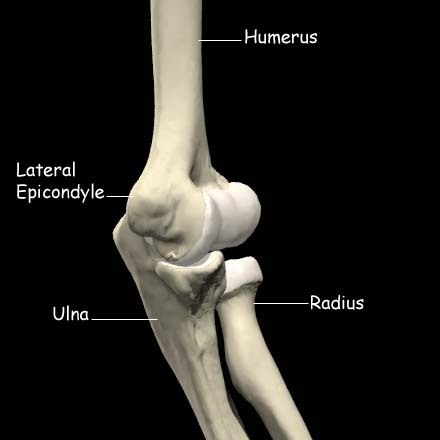 The humerus runs from the shoulder and forms the upper bone of the elbow joint. The lateral epicondyle provides attachment for the wrist extensor muscles (which bend the wrist and fingers back). The medial epicondyle provides attachment for the wrist flexor muscles which bend the wrist down. The humerus ends in a rounded capitellum which articulates with the head of the radius and grooved region, the trochlea, which articulates with the ulna. The radius and ulna run from the elbow to the wrist. The two are joined together throughout their length by a strong interosseous ligament and have a small joint between them at each end. 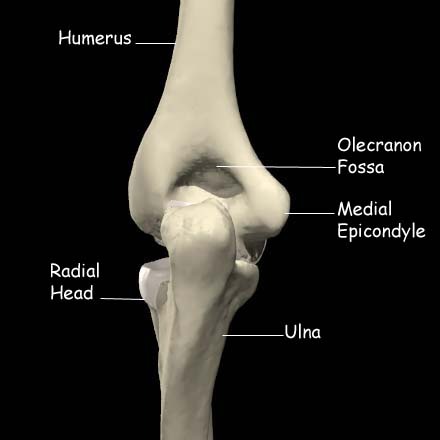 The radius has a small button shaped head at the elbow which articulates with the capitellum of the humerus. This allows the radius (and hence the whole of the forearm) to rotate. The other end is broader and ends under the thumb, giving 3/4 of the width of the wrist. 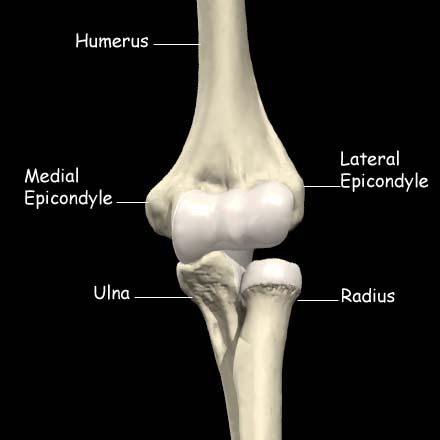 The ulna has a saddle shaped end, the olecranon, which articulates with the trochlea of the humerus. This allows the ulna to glide round the end of the humerus and enables the elbow to flex and extend. The distal (wrist) end of the ulna is similar to the head of the radius and enables wrist rotation.